Decrease in the population of the addax has begun notably since the mid-1800s. More recently, addax were found from Algeria to Sudan, but due mainly to overhunting, they have become much more restricted and rare. Addax are easy to hunt due to their slow movements. Roadkill, rearms for easy hunting and nomadic settlements near waterholes (their dry-season feeding places) have also decreased numbers. Moreover, their meat and leather are highly prized. Other threats include chronic droughts in the deserts, habitat destruction due to more human settlements and agriculture. Less than 500 individuals are thought to exist in the wild today, most of the animals being found between the Termit area of Niger, the Bodélé region of western Chad, and the Aoukar in Mauritania. Today there are over 600 addax in Europe, Yotvata Hai-Bar Nature Reserve (Israel), Sabratha (Libya), Giza Zoo (Egypt), North America, Japan and Australia under captive breeding programmes. There are 1000 more in private collections and ranches in United States and the Middle East. Addax is legally protected in Morocco, Tunisia, and Algeria; hunting of all gazelles is forbidden in Libya and Egypt. Although enormous reserves, such as the Hoggar Mountains and Tasilli in Algeria, the Ténéré in Niger, the Ouadi Rimé-Ouadi Achim Faunal Reserve in Chad, and the newly established Wadi Howar National Park in Sudan, cover areas where addax previously occurred, some do not keep addax at present because they lack the resources. 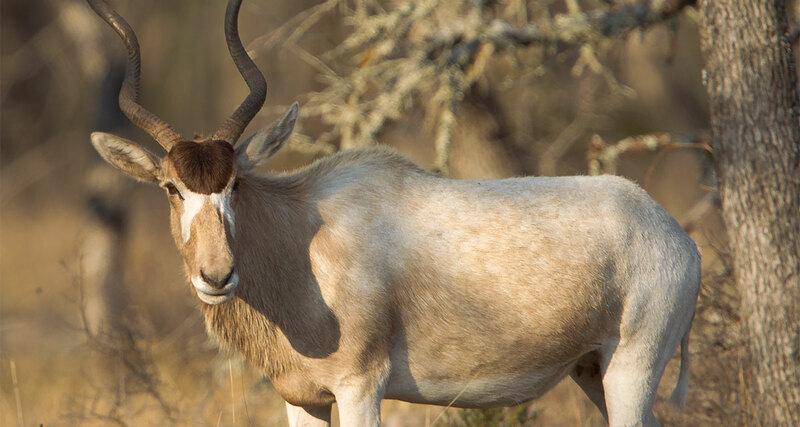 The addax has been reintroduced in Bou Hedma National Park (Tunisia) and Souss-Massa National Park (Morocco). Reintroductions in the wild are ongoing in Jebil National Park (Tunisia) and Grand Erg Oriental (Sahara), and another is planned in Morocco.